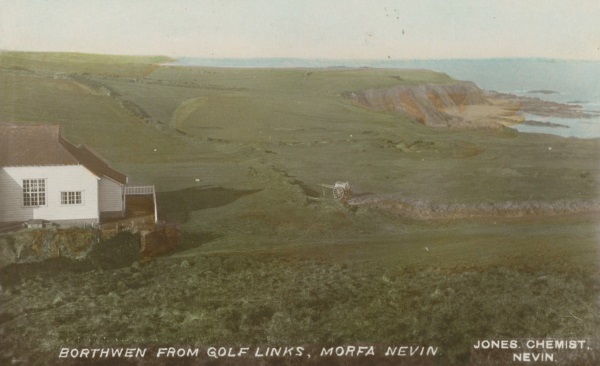 There were two early, part time photographers in Nefyn, John Richard Owen, Tan-y-Groes and Robin John Jones, the Chemist. 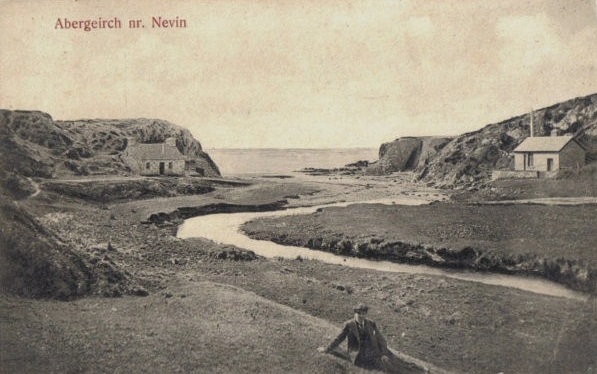 The two men between them took extensive photographs of Nefyn and the immediate Lleyn area from the late 1890’s until the early 1940’s. Prior to that time only a few photographs were ever taken in the district. No historical photos exist for instance of the Gwylwyr Mountain or Bodeilias Point in the 1870’s before they were so extensively disfigured by quarrying even though early cameras existed at the time. 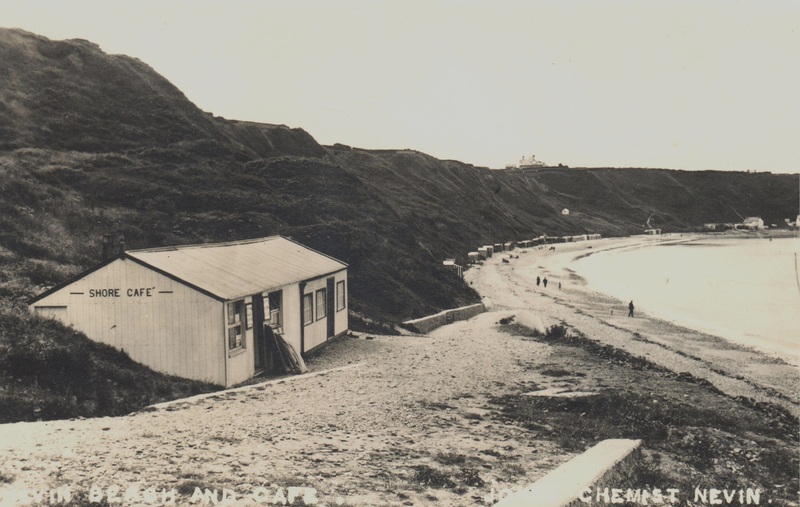 The fifty-year period from 1890 to 1940 were the years when photography came of age and with it the boom of people sending postcard photos from their holiday location to relatives and friends back at home. 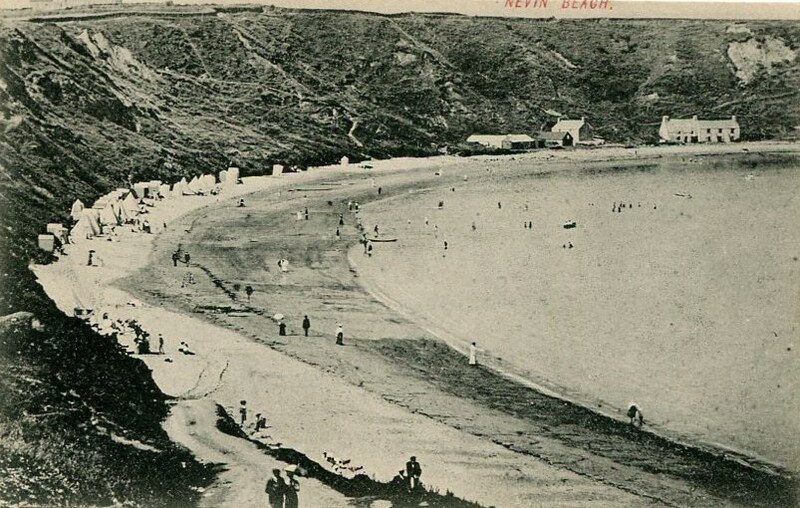 Nefyn was a popular holiday area and both John Richard and Robin John made use of their photography expertise to enhance that local postcard business. Credit must be given to them for taking so many early historical photographs of Nefyn, photographs that are now highly treasured. A few samples of their work are shown in this article, others are distributed throughout the website. John Richard was the earlier of the two photographers. He was born in 1879, the son of Thomas and Sydney Owen, Tan-y-Groes, and his father was a flour merchant and shop owner on Palace Street. John Richard was a grocer by trade and he worked in his father’s shop. He was an inquisitive young man and he became interested in cameras and photography when he was a teenager in the mid 1890’s. This was after he acquired a glass slide photograph of Nevin Beach taken when the sailing ship Venus was launched in 1880. He purchased a folding camera with a tripod and cloak, and on his time off from the shop, he became a familiar figure taking photographs around town. John Richard acquired the necessary photography expertise and he quickly established himself as an entrepreneur in this exciting new business. 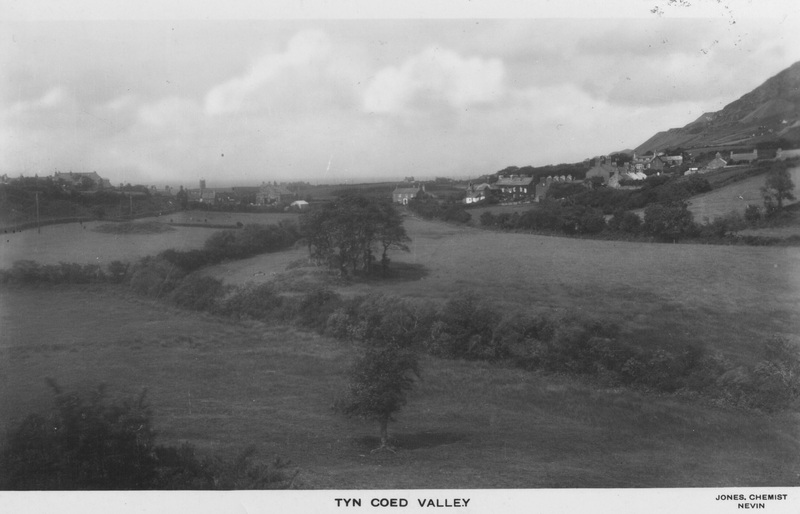 Not only did he shoot the photographs but he also developed them at Tan-y-Groes. 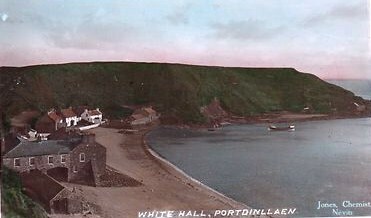 His services were in demand by small local postcard publishers and also by newly established national postcard publishers such as Thomas Brothers, Everton who required scenic photographs of the area. He also did photography work for private parties and business functions at the new Nanhoron Arms Hotel, all in his spare time. 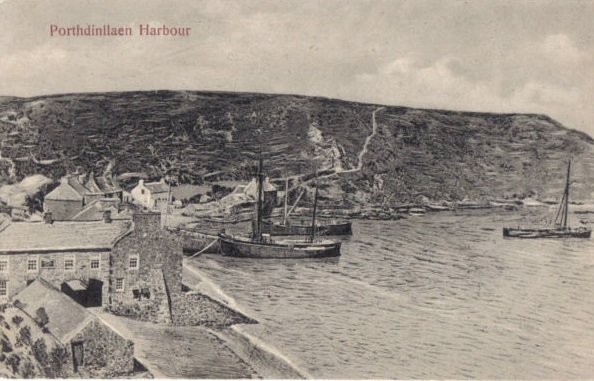 He later learned how to print postcards in large numbers so he could sell them in local shops and in the shops owned by his family, Shop Tan-y-Groes and Bank Place, in Nefyn. He was active with his photography and postcard work for over forty years until the beginning of WWII. 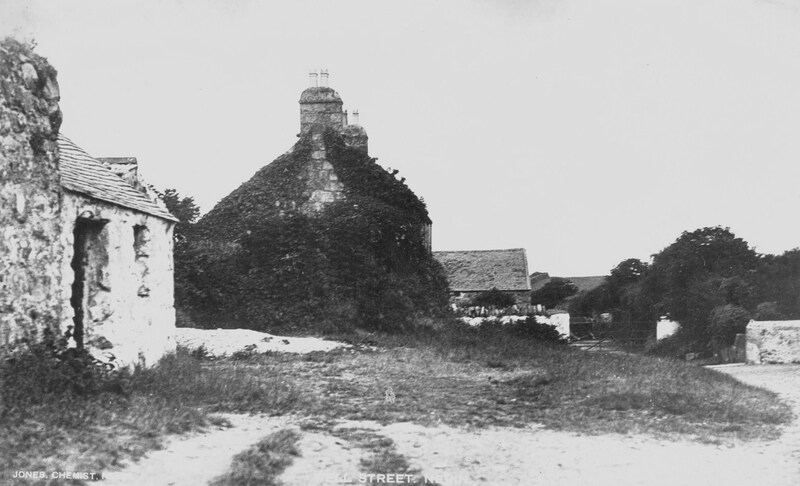 John Richard was married with four children, two boys and two girls, and they lived in Tan-y-Groes (next to the shop) on the Groes in Nefyn. The eldest son John ran a barbershop and sweet shop in Bank Place and it became known as Shop Johnny. The other son Thomas Edwin was a watch and clock specialist and was also a well-known snooker and billiard player in the area. My recollection of John Richard from the early 1950’s was of a tall thin man with a full head of white hair and a large white moustache. He was always jovial and enthusiastic about everything. Even when he was elderly he kept busy with his properties, helping his children in their businesses, and operating a large greenhouse and garden behind Tan-y-Groes on Church Street in Nefyn. He died in the mid 1950’s. Shown below are a few samples of John Richard’s postcard photographs, most taken between 1900 and 1910. 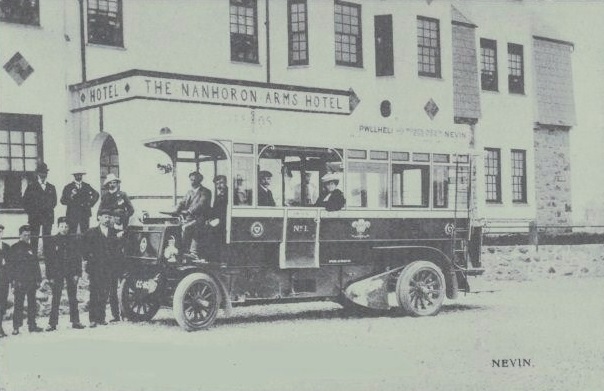 Pwllheli – Nevin Omnibus in front of the Nanhoron Arms Hotel. 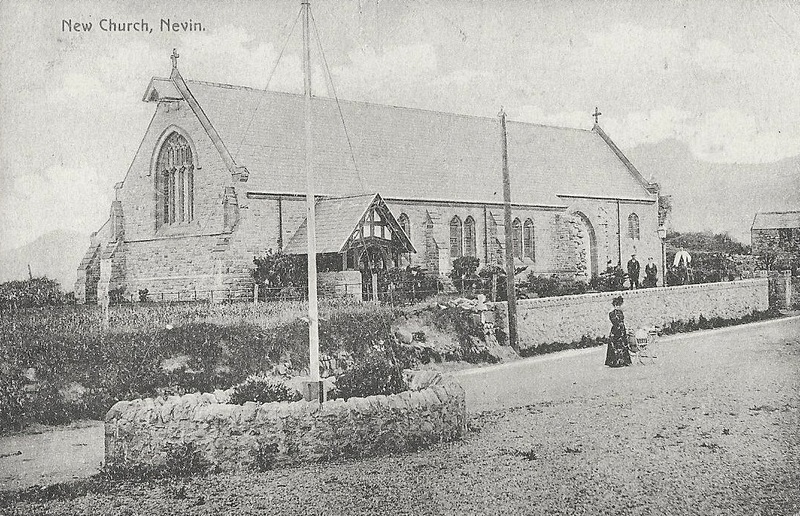 New Church, Nevin opposite the Nanhoron Arms Hotel. Penrhos, Morfa Nevin with brickworks chimney. 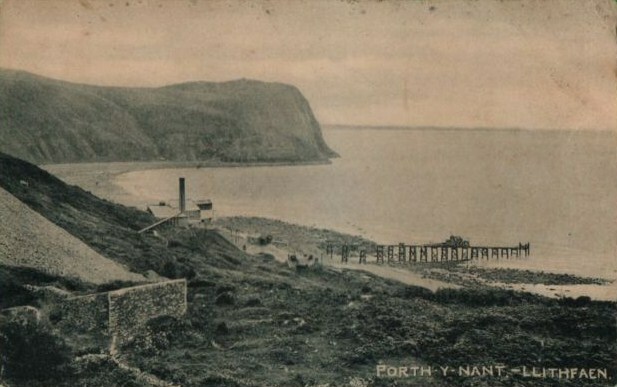 Porth y Nant with quarry pier. Abergeirch with new telegraph building and old farmhouse. The other part time photographer was Robin John Jones the Chemist*. He was born in 1897, the youngest son of Richard Jones the owner of Glynllifon Stores. He was a pupil at Nevin Primary School and the County School in Pwllheli. He was serving as a chemist apprentice in 1914 when WWI broke out. Like many other young men, he enlisted in the Army and served gallantly on the Western Front. He was discharged in 1918 from a hospital where he was treated for a serious gunshot wound to the left eye. 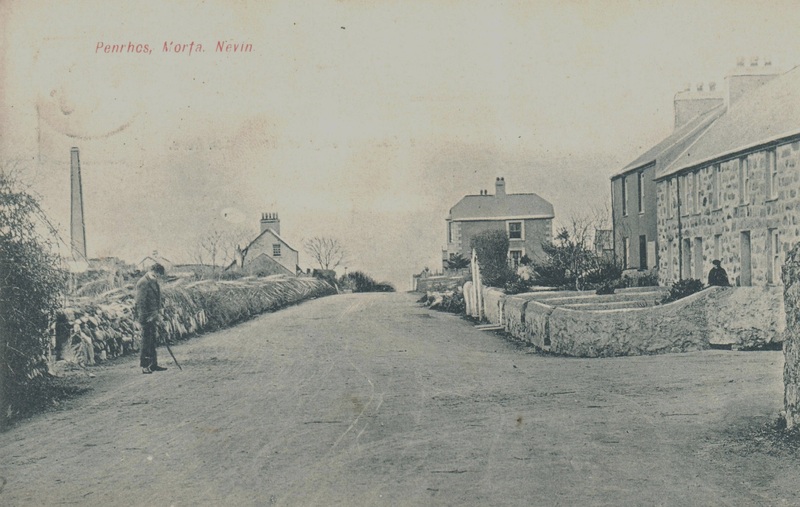 After a partial recovery, he completed his pharmaceutical apprenticeship requirements and then opened a chemist shop on the corner of High Street and Moriah Street in Nefyn. By this time the postcard boom was in full swing and like other pharmacists he naturally took an interest in photography. He became an active photographer selling framed local photos in his shop and later processing and selling on premises postcards of the photos he had taken. 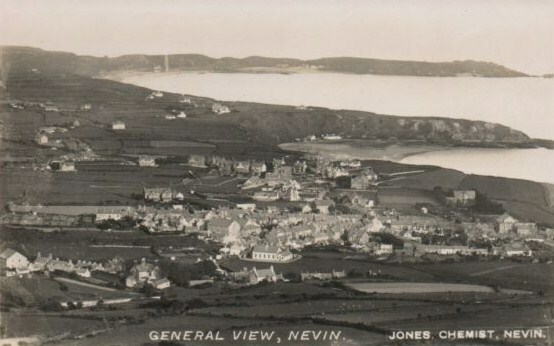 His postcards were always signed Jones, Chemist, Nevin. 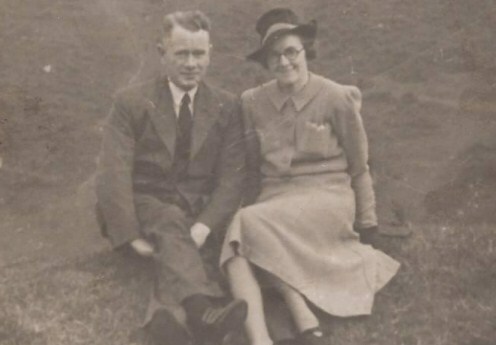 In the mid 1920’s he married a local girl, Mari Elisabeth, who was a teacher in the Edeyrn and Morfa Nefyn schools. 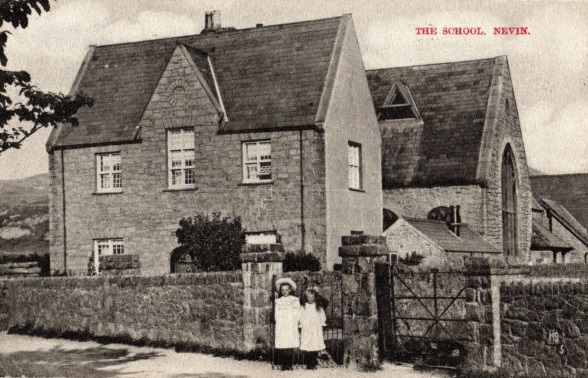 They lived in Llys Arfor, High Street and in later years she gave up teaching and worked with her husband. They were a very popular couple. On their days off from the shop, they would travel together around Lleyn with Robin John taking photographs of scenic spots. Then back to the shop to develop and process the prints and postcards. Robin John also took photographs using an early movie camera and he produced several historical filmstrips. His more well known filmstrip is that of Lloyd George when the ex Prime Minister attended the Nevin Easter Show in April 1940. Unfortunately Robin John continued to suffer from his old war wounds and after a short illness in 1944 he died very suddenly. His death was a shock to everyone, and on April 28, 1944 the Caernarvon and Denbigh Herald reported his death as follows: “The death occurred on Sunday of Mr. R J Jones MPS (Member of the Pharmaceutical Society), Llys Arfor after a short illness. He was a native of Nevin and a popular figure in the neighbourhood. He was a well-known chemist in South Caernarvonshire. He was an ex-serviceman and was wounded in the last war. Mr Jones, who was 47 years of age, took a keen interest in educational matters and was a Governor of the Pwllheli County School; member of the Nevin Town Trust and the Pwllheli and Portmadoc Guardians Committee. He was a faithful member of Capel Isa (CM) Church and of the Sunday School. He was one of the founders of the Nevin and District Sunday School Eisteddfod and presented a massive challenge shield for competition by Sunday Schools. He leaves a widow and three sisters”. After his death, another pharmacist took over as the chemist in Nevin. The new pharmacist lived on Church Street and was also named Jones. He was an excellent photographer as well but of the post WWII era when everyone possessed cameras. The postcard photos he took are often mixed up with those of Robin John’s because Mari Elisabeth the shop owner continued to publish the postcards under her deceased husband’s name. 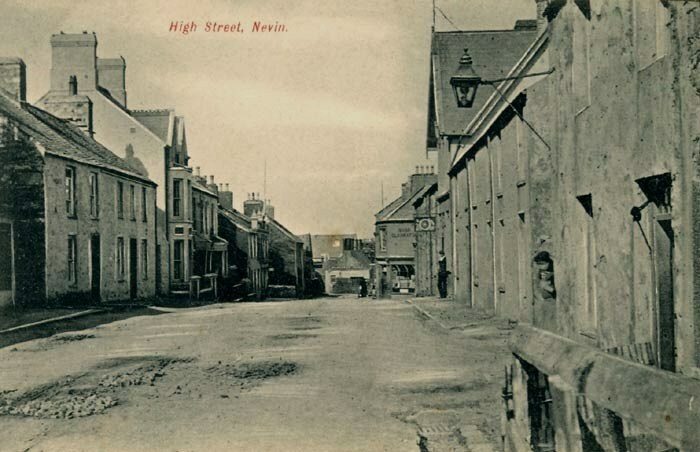 Those postcards were signed R. J. Jones (Nevin) Ltd. Mari Elisabeth continued to work at the shop and many local people have fond memories of “Mrs. Jones, Chemist”, as she was referred to, the always nice and helpful lady with glasses behind the counter. After retiring in the early 1970’s, Mrs. Jones moved to live in Erwenni, the house opposite the Nanhoron Arms Hotel next to Plas Hafan on St David’s Road. She died on July 4, 2007 at the Dolwar Residential Home in Llanbedrog when she was 101 years old. 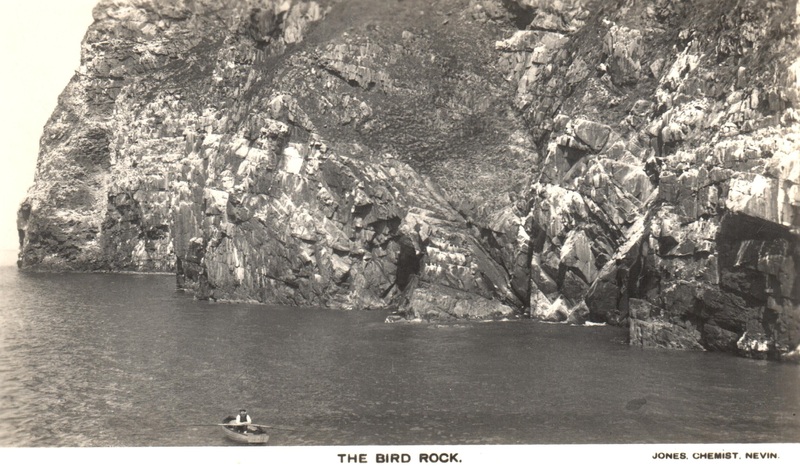 Shown below are a few samples of Robin John’s postcard photographs, most taken between 1920 and 1930. *Courtesy of Hefina Yates, Liverpool. Robin John was Hefina’s great uncle.